Mimi’s Earth Angels is finally back! It has taken almost a year to rework Earth Angels into a new and better book. Earth Angels was originally written in 1986 – before we had computers that can do a whole book at a time. The original pictures were taken with a film camera and individually “screened” in the darkroom to make halftones that are used for offset printing. There was no easy way to get the original pictures into the computer. We had to scan the printed pictures from a copy of the book and then re-optimize them, one-by-one, for the computer. The original patterns were made to be printed on 22″ by 38″ paper for easy printing. We had to redo all the pattern sheets to fit on 8½” by 11″ paper. But those were the small problems. The big problem was the 1990 update. When you are dealing with a paper book, you can put notes here and there to tell the reader to read the pages in different order. That doesn’t work on a computer. Because the 1990 update introduced a separate head, the entire sequence had to be changed. Do the head first, so you can try again if you don’t like it. Then do the body. The original Earth Angels had an attached head and was stuffed from an opening in the crotch. The revised Earth Angels had a separate head and was stuffed through the neck. The new Earth Angel was much easier to make, but we had to shuffle the whole book (and write new instructions). The other big problem was that the original Earth Angels was meant to be read in portrait mode (short edge at the top, binding on the left) but modern screen sizes on computers work much better in landscape mode (short edge on the sides, binding at the top). We changed every page and every picture to make the book work in landscape mode. Displayed by invitation at the Louvre, Paris. Mimi’s Earth Angels is the double-knit fashion doll statement for all cloth dollmakers. Beginers — Over 1000 step-by-step photos in a storyboard format. Each picture is side-by-side with the instructions for the step. No skipped steps. 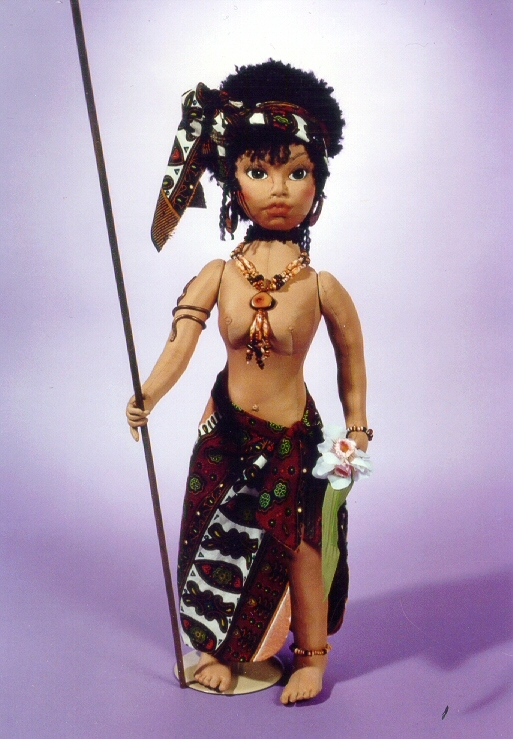 Intermediates — You are learning techniques, that apply to all your dollmaking. Advanced cloth dollmakers — Explanation of how to change different features when you design your own variations or your own dolls. 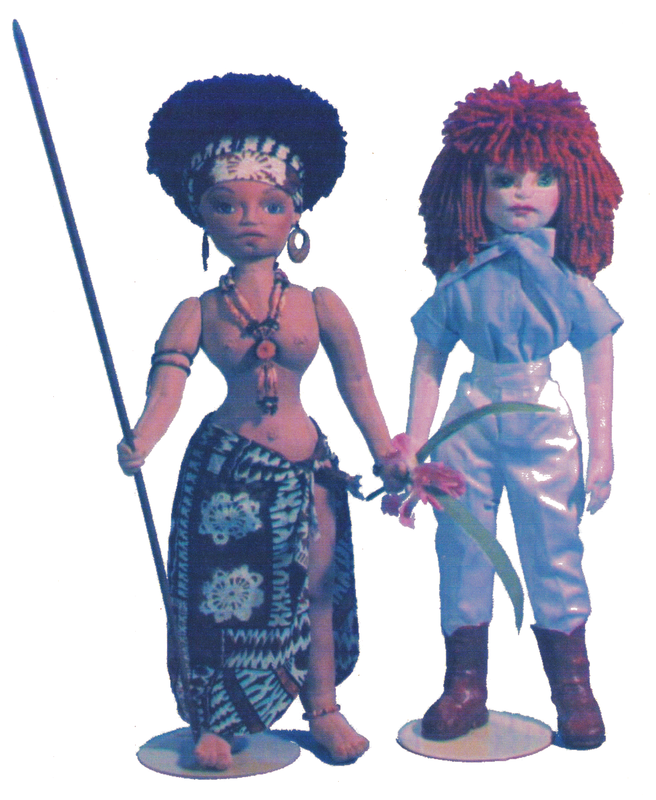 Includes patterns for both 24-inch and 17-inch fashion dolls and basic contemporary clothing. Includes instructions for fitting clothes to your particular doll (which may be a much different size than my doll). Over 1000 step-by-step pictures guide you through every facet of making Mimi’s Earth Angels. Beautiful, full-figured 17″ and 24″ fashion dolls with basic contemporary clothing including: underwear, swimwear, sarong, tank top, designer jeans, slacks, shorts, man-tailored shirt with variations, sandals, boots, crocheted jacket and vest. Mimi’s Earth Angels includes 168-page instruction book, certificate, hang tag, easy new head and foot patterns, and 17″ and 24″ pattern sheets. Mimi has No Evidence of Disease (NED) which is what they call remission now-a-days. She still has the peripheral neuropathy problems from the chemotherapy, but can drive again and is working, but slowly. I’ll try to get a more complete report out in the next few days.